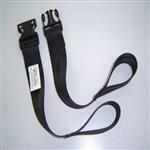 The SELF-RELEASE belts improve safety while seated in the chair. Positioned as close as possible to the waist, they surround it completely (with the exception of the SELF-RELEASE VEST), thereby preventing any risk of sliding forwards. The user can operate the SELF-RELEASE belts themselves. By benefiting from better support in their chair, it will be easier for the patient to take their meals or quite simply to remain correctly upright on their seat during their daily activities. We recommend the use of these abdominal belts with the cushions of the RENOL FOAM range. a velcro system covers the actual buckle fastening. The alert user can thus easily open the strap themselves. Conversely, a less deft patient, such as an elderly person, will experience difficulties operating the system themselves: this prevents them from leaving their chair hastily and possibly falling. Equipped with a pull-cord, the SELF-RELEASE VEST is easy for the patients to use themselves. Ideal for people with a tendency to "relax" forwards, it allows an upright posture by supporting the torso and shoulders. With the protective gloves (RCP01100 and RCP01235), the patient cannot remove the belt.